Sap-infused pine cones are placed near the fireplace to dry. Day by day, the shells blossom by the crackling fire. One by one, the nuts are removed. After tumbling, sanding, drilling and gutting, the final result is a clean smooth nut ready to be beaded. The harvesting of pine nuts requires diligence, just like the journey of the students at the Indian Tribal & Educational Personnel Program (ITEPP). The students and staff of ITEPP have been working year-round to hand make their sashes for graduation. ITEPP started in 1969 with 18 students. 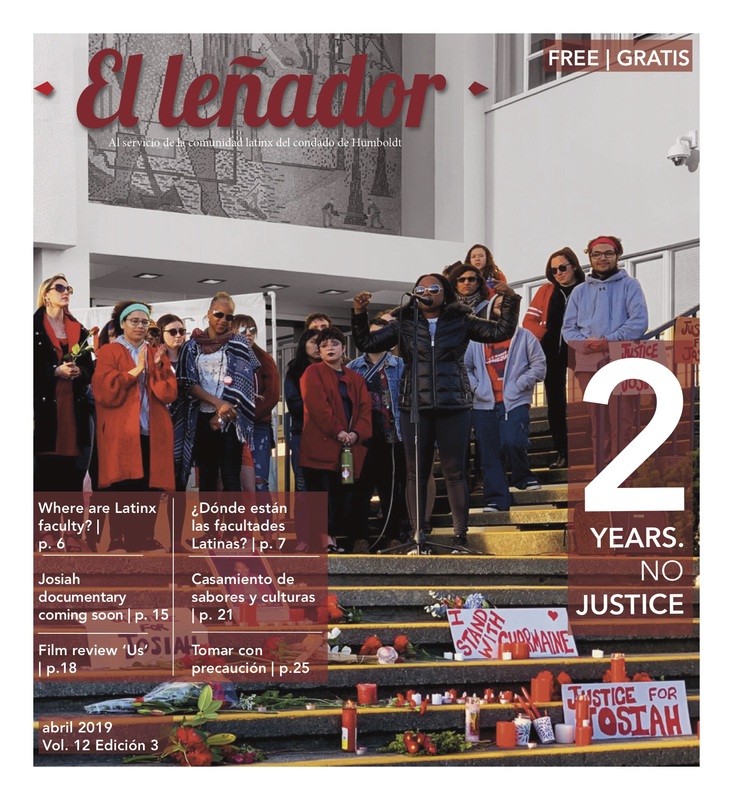 At the time, the program only accepted Native students majoring in Native American studies who were earning a teaching credential. Over the years the program has expanded to all Native American students. Marlette Grand-Jackson ITEPP academic advisor and HSU alumnus, has been watching the program progress for 15 years. She has taken it upon herself to help prepare the sashes for the ITEPP graduation ceremony on May 10. Grand-Jackson said there are 400 self-identifying Native students on campus. 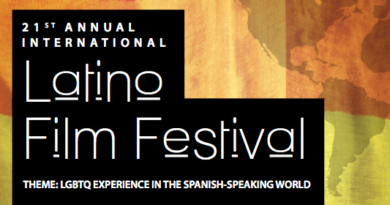 This year they expect 50 students to participate in commencement. The ITEPP signature sashes first started being made in 1995. They were hand made by the undergraduate students for the graduates. The same basket nose snake pattern is still used to commemorate the original hand drawn pattern. 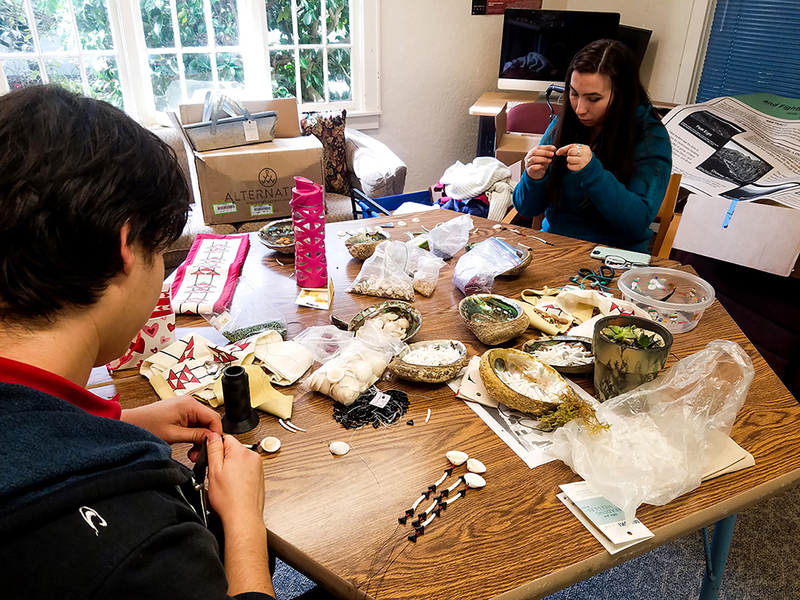 Today some undergrads, such as Elaine Tseng-Gill, part of the Cherokee Nation and freshmen at HSU, continues the tradition by helping make the sashes for their fellow upperclassmen. The process began last summer when Grand-Jackson sent out the snake nose basket design to get screen printed on the fabric. She then sewed on the red quilting to finish off the sashes. 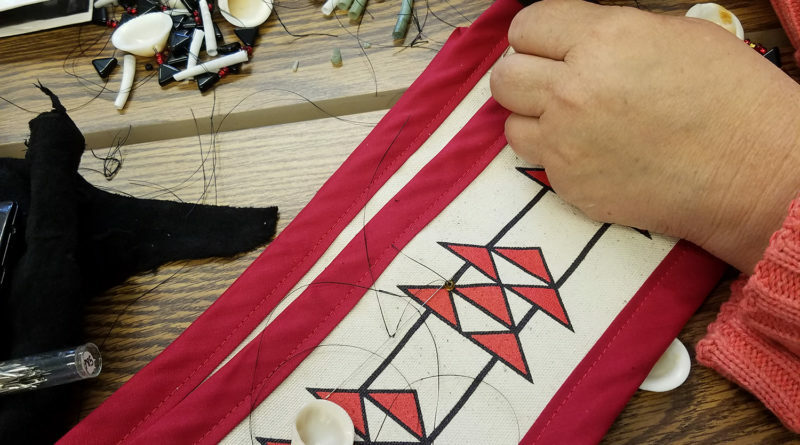 With Grand-Jackson’s initial handwork complete, the students at ITEPP now have the last few weeks before graduation to customize their sashes with jeweled accents that will dangle off the bottom. 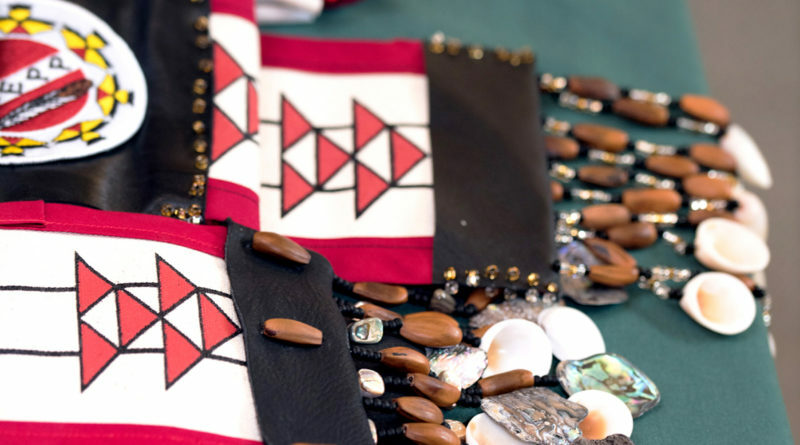 All of the ingredients used for the sashes are local except for the dentalium, which are long tooth shells that have been used as money by local tribes since before 1854. The clam shells and abalone are sourced from some of the local beaches and bought from the Sea Around Us shop in Trinidad. 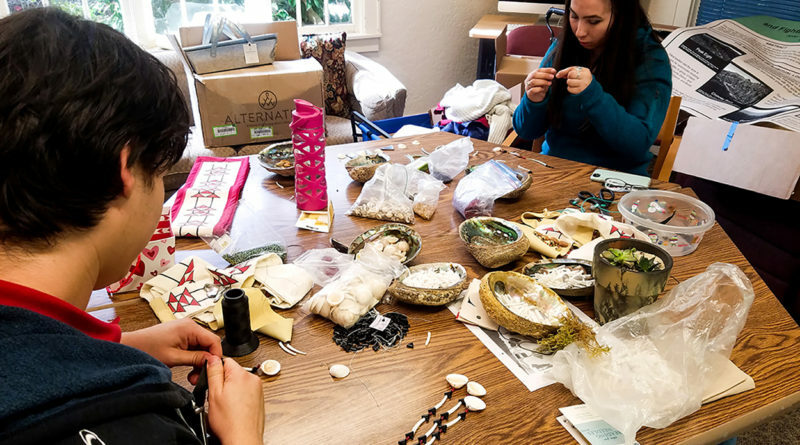 The beads were bought from the local bead stores or were donated, and the pine nuts were single-handedly harvested from pine cones that Grand-Jackson picked along various areas east of Redding. Students also bring outside ingredients from their area. Once the shell and bead accents are attached, the sashes are then finished off with black leather details and the ITEPP patch. 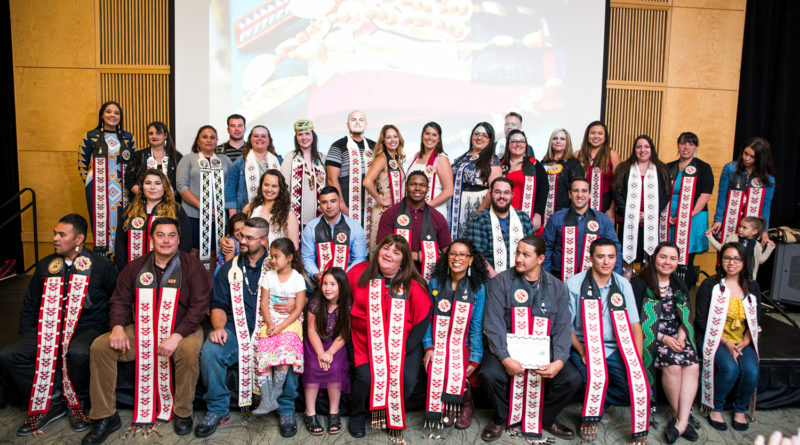 For some of the students at ITEPP, such as graduating senior Matthew Sylvia, the sashes are a statement piece showing their academic efforts and achievements.